Sure, it’s great to disconnect from technology and simply enjoy your wilderness experience, but it’s very rare that anyone will hike without a cell phone these days. Your mobile device just might save your life in an emergency. Plus, it can provide a multitude of other functions. Let’s go over some of the most common uses for smartphones on the trail and share some tips on how to optimize your mobile device for the trail. This is the most obvious use for cell phones on the trail because most everybody has a special someone who would appreciate a reassuring text message or regular phone call. Also, calling or texting for a shuttle, hotel or hostel reservation is mighty helpful at times. The big four are Sprint, T-Mobile, AT&T, and Verizon. There are other options as well, for example, Straight Talk and Comcast’s Xfinity Mobile. Some of the smaller companies run on the same networks as the big providers. Do some research and find a plan that suits your needs; I’m going with an unlimited prepaid plan. Currently, Verizon is considered to have the best coverage on the Appalachian Trail, but be forewarned that coverage on the AT is spotty at best. Save battery life by putting your phone in airplane mode so it won’t constantly search for cell towers, Wi-Fi, and Bluetooth connections. The camera functions also drain batteries pretty fast. Most hikers carry a portable charger. About 3,000 to 10,000mAh will get you to the next town depending on how much you use your phone. Look for one that uses high-speed charging or quick charge. You don’t want to wait six to eight hours to recharge a power bank. Scouting for outlets in grocery stores is an acquired skill; look for vending machines. Most hotels and hostels have easily accessible outlets. Phone batteries are sensitive to temperatures. When it’s really cold, keep your phone next to your body. I’m going with the Lifeproof case on my iPhone and even that goes in a ziplock bag when it’s raining. I don’t think there is a truly waterproof case out there so double and triple your protection efforts in foul weather. Again, many app options available. Get one with live radar, for example, MyRadar Weather Radar. The AT Weather website gives you forecasts for all the shelters along the Appalachian and Pacific Crest Trail. There are many hiking apps available. However, many of them rely on Wi-Fi or cell service, which is OK for planning but not so helpful in the backcountry. For me, the most useful app on the AT is Guthook’s. Also, Google Maps can work offline, using GPS rather than cell connection. However, the Google Maps area must be downloaded before leaving your good connection. If you don’t want to carry the guidebook, then put the PDF version on your phone. I have The A.T. Guide by AWOL. This PDF version has live links to websites, email addresses, coordinates, phone numbers, and page references. You might want to have a backup copy stored on Google Drive or somewhere if you need to reinstall at some point. 2. When you’re ready to share your current location, type “I’m at” (make sure to hit the space bar after at). 3. You’ll see “Current Location” appear just above the keyboard. 4. Tap it to send your location, wait a moment before tapping a second time; it can take a bit to respond. A pin with a quick link to get directions to your location will be sent, and you don’t have to send any text with it; the “I’m at” is just a trigger to call up the shortcut. Alternately, you can let someone else share their current location quickly with you by asking, “Where are you? With emergency SOS in iOS 11, you can quickly and easily call for help and alert your emergency contacts. Here’s the skinny on the Apple website. The cameras in phones are pretty amazing these days. You can also get add-on lenses, portable tripods, selfie-stick attachments for your trekking pole, and all kinds of apps to improve your photos and videos. 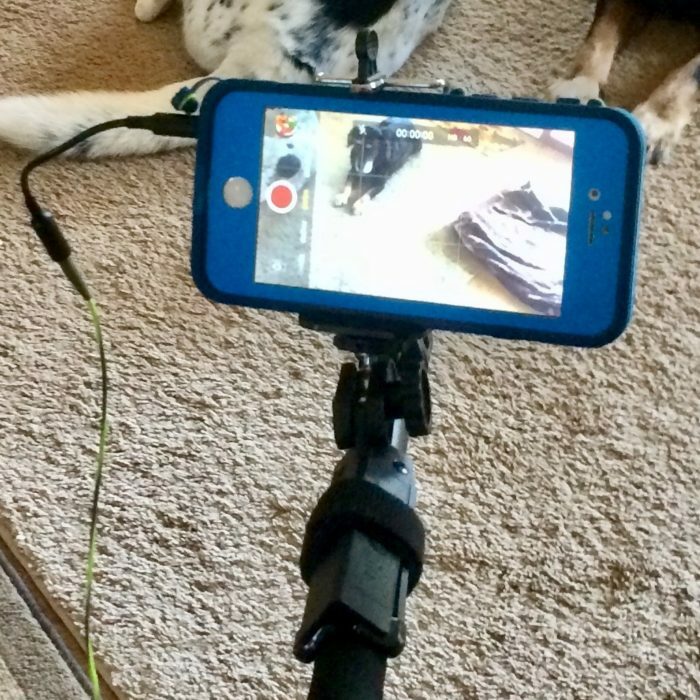 I like to keep it simple, so just a few tips here: keep the lens clean, shoot video in landscape mode (hold the phone sideways), and use the microphone on your earbuds for a better sound than the mic on the phone. Of course, keeping up with your emails is a good idea. Some equipment manufacturers do not have a phone number and only offer email contact (i.e., Zpacks). Also, web browsing and online shopping are useful. For example, if you need something specific, Amazon can ship to wherever you’re headed. Share your experience. It’s amazing how many folks like this stuff. YouTube, Trail Journals, Instagram, Blogger, The Trek, Facebook, and so on. Warning, not all hikers want to be on social media; ask before you point your camera at other people. Some folks like to listen to podcasts, music, movies, and books, which can be downloaded before you hit the trail. Seriously, use earbuds; nobody else wants to hear your music. Ever! Below is my improvised selfie stick, a Pedco UltraPod strapped to a trekking pole. Remember: A mobile device is not a substitute for gear, experience, and knowledge. Do not depend on a mobile device for safety. Think of it as an additional tool, and not the only one.